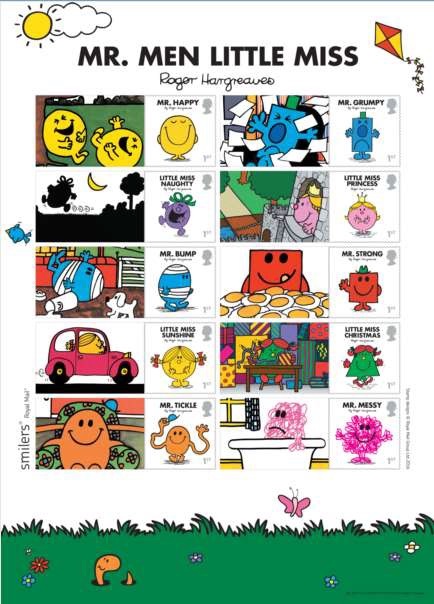 Mr Men and Little Misses celebrate 45 years on 10 stamp set. Well the design for this one wasn't difficult, even though it is attributed to Bath-based Supple Studio. I suppose they added the Queen's head and the value to the existing book-cover-based artwork. Mr Tickle first appeared in 1971, followed by 38 other Mr Men created by Roger Hargreaves by 1978. Thirteen Little Misses appeared in 1981, with Little Miss Princess appearing in 2011 to mark the 40th anniversary of the series, and by 2015 the total of the whole range reached 85 titles - see Wikipedia for the full list including latest 2016 titles. Royal Mail are marking the 45th anniversary (yes, forty-fifth!) of the creation of the Mr Men by Roger Hargreaves with a set of 10 stamps. The Mr Men and Little Miss series is one of the most iconic series of children’s characters ever created. Successful series of books and TV cartoons have been enjoyed by generations since the birth in 1971 of Mr Tickle, Mr Happy and the rest. Loved thanks to the bold, colourful designs and universality of personality traits which each character exhibits the Mr. Men and Little Miss books have been absorbing and enchanting children worldwide for 45 years. Mr. Men and Little Miss books are published in 18 languages, including Hebrew and Icelandic. Over 250 million books have been sold worldwide. Mr Happy, Little Miss Naughty, Mr Bump, Little Miss Sunshine, Mr Tickle, Mr Grumpy, Little Miss Princess, Mr Strong, Little Miss Christmas, and Mr Messy. The set of ten 35mm square stamps are printed in strips of 5 (2 sheets) in sheets of 50, by ISP in litho on ordinary gummed paper. The set is also available in an A4 self-adhesive generic sheet (shown below), although only six of them will be available in Royal Mail's personalised Smilers programme. I can't help thinking that Royal Mail is being a little optimistic, or is maybe relying on unkind parents. Would it be right to put a picture of your young boy alongside a 'Mr Grumpy' stamp? Mr Strong or Mr Tickle, maybe, but whose kid is going to be forever remembered as Grumpy. And again, where's the balance. Miss Sunshine and Miss Princess are positives. Mr Happy is a positive, but Grumpy and Messy....? Maybe I'm overthinking this, but I'm not sure that it has been throught through enough from a marketing and business point of view - not that we will be stocking them, unless there is something interesting on the Machin stamp in the Retail Book. And surely this is only the first, containing as it does just two Mr Men stamps. Not only are there 8 more in the set, but once again the Little Misses lose out. Added: Now that we have the actual booklets we can show the cover, and demonstrate that this is in Royal Mail's new Chevin font, and the actual definitive stamps are in the new deep scarlet shade of Royal Mail red. The whole thing strikes one as being just a little underthought, maybe too hastily put together, suggesting perhaps that this isn't 'Project Atlas' (the original working title of the October issue) at all. I wrote a letter of complaint to a business recently, and got a response back with the "Mr Grumpy" stamp duly attached! Neat! Whilst I wouldn't condone being rude to customers, it does make you wonder whether it was intentional or accidental, and if the latter - business should think about what the message to the customer might be, other than what is inside the envelope! At least it was a "real" stamp. We still send payment for bills via post - I've used the conger eel stamp (2014) for the electricity bill. The worst ever design for sending the wrong message was the 44p value of the 1999 "Soldier's Tale" set which depicted rows of grave stones. Whilst I understand the message it was trying to convey I really think that receiving a letter with a stamp depicting gravestones might well have been rather unnerving if not distressing. Some times designers can be just that little bit too clever. Especially if your husband has just passed on ! !